Do you want to permanently delete your WhatsApp account? Do you want others to no longer see you on their WhatsApp’s contact list? 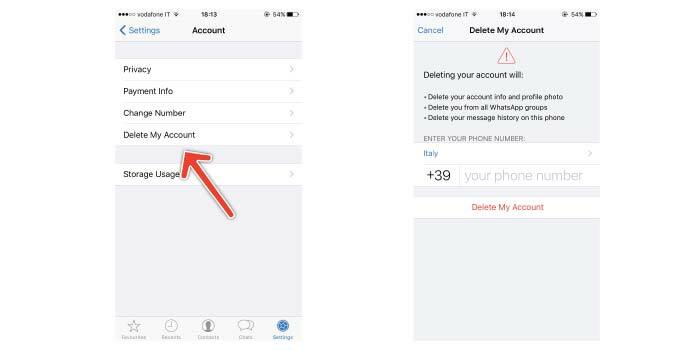 The following is a guide to get rid of your WhatsApp account from your iPhone, Android or Windows Phone. At the end of this short article, you will be able to delete WhatsApp account quickly. Be aware though that to no longer appear in your friends’ WhatsApp’s contact list it’s not enough to simply uninstall the app from your smartphone. By doing so, you will only remove the app but not the account associated with your phone number. Take just a couple of minutes to learn how to deactivate your account and show the label ‘Invite’ to others. If you instead want nobody to see your profile picture, status, and “last seen”, I recommend that you read the article “How to be Invisible on WhatsApp“. Enter your phone number in the full international format. Delisting your phone number from your friends’ WhatsApp contacts list. Elimination of all WhatsApp groups. Deleting the message history on your phone. Is it possible to reactivate deleted WhatsApp account? You can still reactivate your account after you’ve deleted it. Just follow the instructions for a new account, enter your previously registered phone number, and wait for phone number verification.